I have a nagging issue with Illustrator CS (both 2018 and 2019) and bitmap fonts. Briefly, character spacing is wonky (some letter pairs too loose or too tight) when text is in area type but alright when in point type. Photoshop renders the text just fine in area type. I'm using CG 3x5 pixel font but I see this with other bitmap fonts as well. I've taken a look at the font in FontLab and there doesn't seem to be an issue with any of the glyphs. This is one of those issues that may either have a simple solution. I really don't want to have to hack it by changing all text before export to point type -- I'm setting a lot of different text boxes around shapes and need the area type. 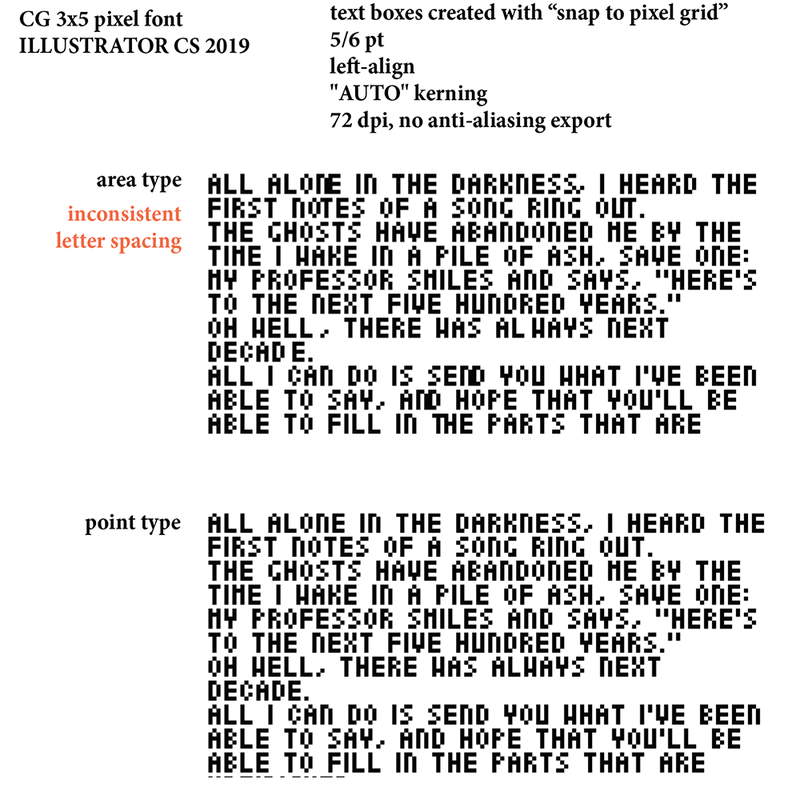 I believe I'm doing everything appropriately: snap to pixel grid, appropriate 5 pt font size (multiples of 5pt for CG 3x5), auto kerning (neither metrics, auto, nor optical fix the issue), no anti-aliasing on export. Is there a fundamental difference in how Illustrator manages type in area type vs point type when it comes to figuring out how to space characters? I can't figure it out -- the spacing is even wonky when using the monospaced version of the font. Browse other questions tagged adobe-illustrator fonts kerning bitmap spacing or ask your own question. Does anyone know a good pixel font 7px tall? How to make a non-spacing and non-marking glyph? Pasted vector from Illustrator into Fontlab not true to Key Dimensions despite being set in both programs?